Investigate before you cut… Conduits are placed both in suspended slabs and in or below concrete slabs. In the past, concrete x-ray was the only available procedure to investigate suspended concrete before cutting or drilling. However, x-ray requires access from two-sides, making the task expensive and time-consuming; it also requires large evacuation perimeters, making it an unappealing option for a job site or project. Concrete x-ray technology has been replaced by Ground Penetrating Radar (GPR) technology. GPR delivers much more accurate results, is completely safe to use and provides clearer 2D and 3D projections than concrete x-ray. GPR also produces images in real time for the technician to analyse onsite, whereas x-ray images must be taken away for development and data review. GPR is also quicker, scanning a much larger area than x-ray in any given time period. 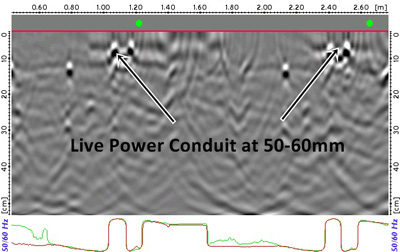 GPR achieves these advantages by using radio frequencies similar to a mobile phone to ‘look’ into the concrete. 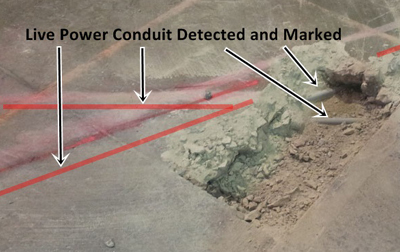 Detecting where live power and conduits are, prior to cutting or drilling, saves both time and money. During a hospital refurbishment project, a plumbing contractor is tasked with cutting trenches and core holes into the existing ground slab. The accidental cutting of one conduit could potentially cause loss of power for a nearby section of the hospital, having disastrous effects and potentially causing serious or fatal injuries to the operator. 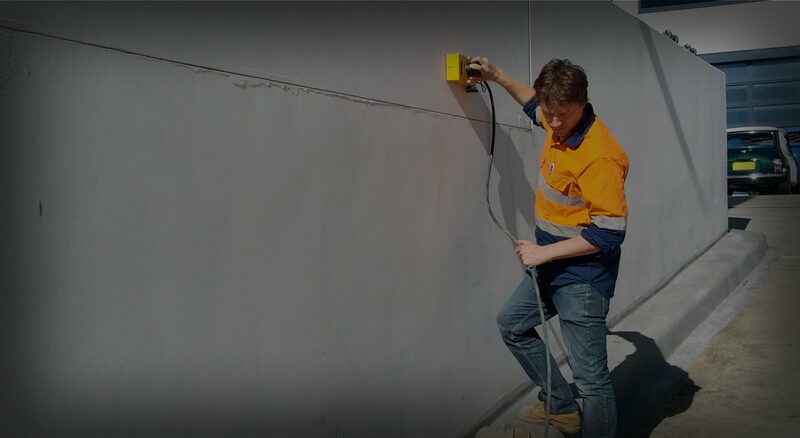 Using GPR technology, Concrete Scanning Services detected and accurately marked all present live power, conduits and other utilities in and below the slab quickly and accurately. This was achieved without any disruption to the hospital or slowdown of the project progress. That's fine, we offer a 24 hour, 7 day a week service. Feel free to contact us for an obligation free quote.